Peru is a fascinating country and few westerners know its trails and best kept travel secrets better than Andreas Holland. Andreas has contributes so much in making our South and Central American programs special. He has lived in South America for over 25 years. Much of this time has been spent in Peru where he has amassed a wealth of experience that would be hard to equal. His innovative itineraries and desire to share his love of South and Central America are key factors that ensure the success of our outstanding program. At all levels Andreas engages indigenous peoples in our operations who are simply fantastic and take our itineraries to new heights. Read an interview with Andreas Holland. Geography: Peru is located inwestern South America, bordering the South Pacific Ocean, between Chile and Ecuador, whilst also bordering Bolivia, Brazil and Colombia. Peru has an area of 1,300,000 square kms. The geography of the country includes the western coastal plain (costa), the high and rugged Andes in the center (sierra), and the eastern lowland jungle of Amazon Basin (selva). The lowest point is at the Pacific Ocean at 0 metres and the highest point is at peak of Nevado Huascaran at 6,768 metres. Culture: Peru has a population of 28 million, made up of pureblooded Indians (biggest group are the Quechuas, whose forebears were the “Incas”) and Mestizos, who are a mixture of Indian and European backgrounds. More than half the population lives in the largest cities, namely Lima, Arequipa and Trujillo. The official languages of Peru are Spanish and Quechua. The predominant religion of Peru is Roman Catholic (81%) bought in by the Spanish conquest. All international flights to Peru arrive in the mega-city of Lima. It’s worth spending time exploring the historic colonial centre, visiting the Gold Museum to see the impressive collection of Inca gold artifacts and also sampling the city’s world famous cuisine. Cusco, the capital of the Inca Empire, is an hour flight from Lima, and is nestled in the foothills of the Andes ranges at an altitude of 3,300 meters above sea level. Walking around Cusco there is evidence on every street corner of the incredible and utterly fascinating Inca stonework, combined with majestic colonial architecture. The city offers a diverse spectrum of experiences including visits to the colourful San Pedro food market and the charming white washed, tiled artisan neighborhood of San Blas. The magnificent Inca Fortress of Sacsayhuaman is an absolute must with its colossal rocks exemplifying the finest of Inca stone masonry. The drive from Cusco to the scenic Sacred Valley of the Incas offers spectacular views of the impressive Veronica and Chicon glaciers and pretty patchwork hills. The village of Ollantaytambo, at 2,800 meters above sea level and located between Cusco and Machu Picchu, is the most accessible and best preserved Inca village in Peru, with its cobbled streets, trapezoidal doorways and glacial water filled canals. Above the village rests the beautiful fortified Inca temple and citadel. The Sacred Valley is rich with intriguing sites, including the picturesque pre-Inca salt mines, whose 5,740 pools are still harvested by locals today as well as the impressive concentric ruins of Moray, which are theorised to have been used as an agricultural experimental site due to the various micro-climates, to name a few. It goes without saying that the highlight of any trip to Peru is Machu Picchu, one of the recently declared Seven Wonders of the World. Majestically located atop a cloud-forest ridgeline this magnificent labyrinth of perfectly sculpted temples, stairways, aqueducts, terraces and ceremonial sites is simply breathtaking. Peru also has an incredible bio-diversity best demonstrated by visiting the rainforest of southeastern Peru. This area has some of the greatest variety of wildlife and record numbers of bird species in the world. The vast network of river systems, which make their way down from the Andes ranges, eventually flow into the Amazon River, the second largest river in the world. The lush vegetation and the towering trees form dramatic canopies which are teeming with wildlife. Another example of a great natural wonder combined with unique fauna is the Colca Canyon. Considered the deepest canyon in the world, Colca is one of the few places where one is guaranteed to see the heaviest of all the birds, the magnificent Andean Condor. Located a short drive from Colca is the picturesque white city of Arequipa, with one of the most beautiful colonial squares in South America as well as superb views of the classic volcano, Misty. Lake Titicaca, the highest navigable lake in the world, at 3,800 meters above sea level is split between Peru and Bolivia. Not only is the lake beautiful but also it is unique in that it has a series of floating reed islands populated by indigenous people. The houses, boats and many other objects on the islands are made entirely of totora reeds. 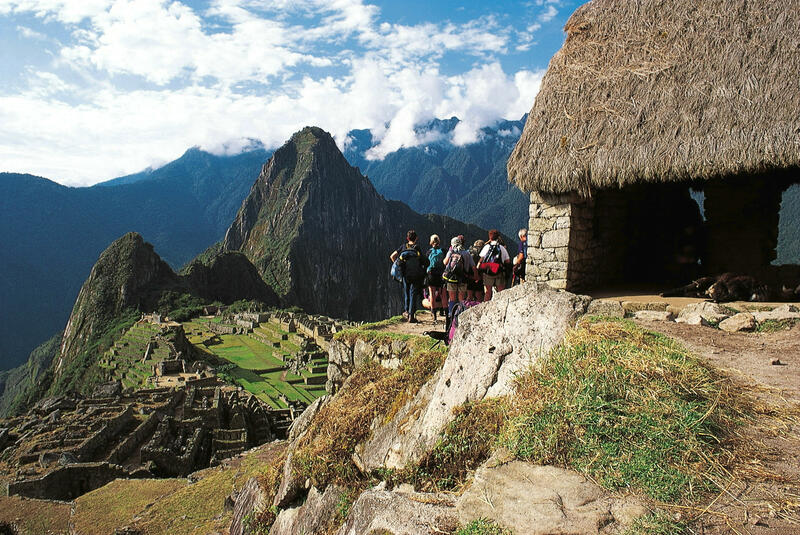 Peru offers many diverse and exciting cultural and adventurous experiences for school groups. The Urubamba River, which runs through the Sacred Valley of the Incas, presents many possibilities for adrenalin pumping white water rafting and kayaking. The scenic backdrop and experienced guides make for an enjoyable day of adventure. Choquequirao trek, give student the opportunity to follow the same routes and appreciate the same spectacular scenery as the Incas did. This is also an opportunity for the students to not only camp in remote areas and get close to nature but in some places they will walk through isolated communities in which they will be exposed to the traditions and way of life of the rural Andean people. The Andean region of Peru is well known for its remarkable weaving traditions. School groups can take the opportunity to visit weaving villages where they will be given demonstrations of age-old traditional dying, spinning and weaving techniques. 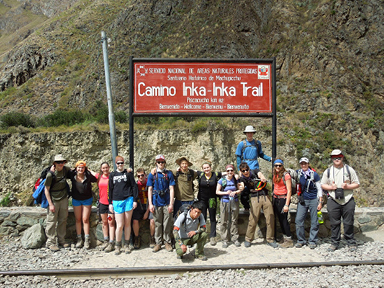 The students learn new skills and are given a first-hand insight into Inca practices and folklore. 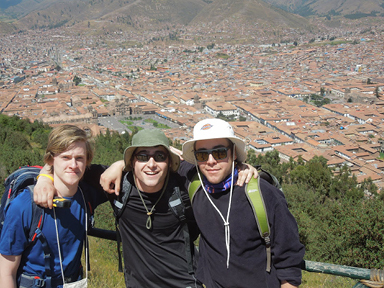 An invaluable way to get a better insight into Peruvian customs and for the students to feel more integrated into Peruvian culture is through home-stays. There are two home-stay options. Students may stay with families in major cities (such as Cusco or Arequipa) and attend Spanish classes. This allows them to get a grasp of the language and to experience modern city life. Those more adventurous souls can do their home-stay in the unspoilt and unusual island of Taquile on Lake Titicaca. Here the students will live in reed homes on the floating island (with a total area of less than 6km2). The main industry on the island is fishing and agriculture and they are also known for their fine woven clothing. Here students will get a genuine perspective of the simple and very traditional way of life of the Taquile people and experience true community living. The most rewarding experience, which the schools groups can undertake is that of community work. This is the chance for the students to get involved and give something back, as described below. There are many rural isolated villages in the Andes that are neglected and as a result lack the most basic of facilities. There are many opportunities for school groups to donate funds and participate in community projects. These projects are carefully designed with an emphasis on durability and sustainability whilst respecting and maintaining local traditions, value and culture, and very importantly assuring continual collaboration with the local community. School groups will be able to participate in such missions as; the construction of school buildings, toilet facilities, simple foot bridges and installing potable water systems from natural springs. Since many isolated villages lack any sort of sporting facility an enjoyable and worthwhile experience for school groups is the levelling and grass laying of football fields, which usually ends in a spirited and enjoyable game of soccer with local children. Community work not only offers the school groups the chance to integrate with and understand the workings of local communities, as well as the satisfaction of getting their hands dirty and being involved on a very personal level with the project, but also the opportunity to really experience genuine teamwork and most importantly of all, giving invaluable and worthwhile help to those who really need it. It’s naive to think that we can travel within a country and have zero impact on the environment and cultures we visit. Instead we should aim to have minimal impact. Here are some tips to assist you in reducing your impact on the environment and cultures of Peru. 1. Travel carbon neutral: it’s estimated that 95% of carbon emissions produced on adventure travel holidays can be attributed to air travel. And as we all know, carbon dioxide is one of the main greenhouse gases contributing to global warming. Travellers should consider neutralising their air travel by offsetting the carbon produced by purchasing carbon credits that are directed towards the establishment of renewable resources. Travellers should also enquire about offsetting the carbon produced because of their land arrangements, such as accommodation and land transport. 2. Save on plastic: ten years ago plastic bottles were virtually unknown in Peru. Nowadays drinking water and most soft drinks are sold in nonreturnable plastic bottles. There exists virtually no infrastructure or facilities for recycling plastic, rather plastic bottles at best end up in landfill but vast quantities are washed away with other rubbish into the rivers. Travellers should take their own drinking bottle and refill it with water at a reliably clean source instead of purchasing water in plastic bottles through Peru. 3. Consider before you take photos: travellers should always ask permission before photographing people. Body language can be used to communicate your intentions and it is important to always respect the wishes of your subjects. Care also needs to be taken when photographing sacred sites and other monuments. It’s normal that signs will be visible to alert you when photography is prohibited. 4. Dress appropriately: dress standards are more flexible in cities but, as a general rule, remote and rural communities tend to be more conservative. Invariably, keeping your dress codes sympathetic to the locals will promote acceptance and respect. 5. Don’t encourage begging: begging is a harsh reality of life in Peru, but it’s something that shouldn’t be encouraged, especially by visitors who do not understand when it is appropriate. Giving money to street beggars should always be avoided as it leads to dependency upon this as an income, reducing the incentive to seek employment and long-term solutions to poverty. 6. Take care of nature: when enjoying a wilderness areas always endeavor to leave the site in the same or if possible better condition than you found it by collecting rubbish and disposing of it in the correct manner. When walking in wilderness areas it is important to stick to the trail, even if it is muddy, slippery or wet. Walking around muddy spots or along the edge of the trail only extends them, compounding the problem and makes unsightly new trails. Also, be aware of where your feet are tramping. The delicate flowers, herbs, ferns and lichens that grow alongside trails are easily killed with 60kgs of walking boot on them. Avoid the temptation to pick vegetation. Flowers are the reproductive organs of the plant and if you pick them, the chances of it reproducing will be greatly reduced or eliminated. 7. Preserve Peru’s history: Travellers should never take souvenir pieces from historic sites. 8. Animal conservation: Avoid purchasing goods made from animal products. The market for these items contributes to the poaching of animals, even in protected areas. Goods to avoid include anything made from animal skins, horns, bones,shells, seashells and some traditional medicines. Andreas is the man who oversees all of the trips operated in Peru through World Youth Adventures. 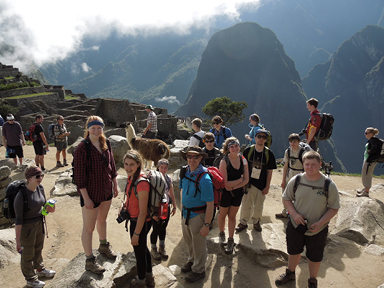 Benefit from his experience and get in touch with your nearest World Youth Adventures office to discuss your next school adventure to Peru.